Before a dispense process can begin, the system must know where the product surface is located. Locating the product surface is done using either a contact or non-contact method. Surface sensing is performed before the process starts and also may be done at various locations across the substrate to compensate for variations in product surface. Systems may be configured with only one type of surface sensing. Changing the method of surface sensing is NOT recommended as part of a process setup. Contact Surface Sensing is the most reliable method of surface locating. Surface location is accomplished by having a small pin tip touch product surface. Surface location is defined by the point at which pin tip triggers on product surface. Various types of probe geometry are available to accommodate product layout. 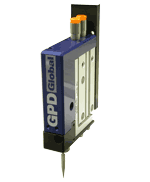 Contact probes achieve a repeatability of +/- 0.0003" on any surface. Surface color, texture, and reflectivity are not an issue with contact sensing. Contact Surface Sensor - video. Optional displacement, non-contact, laser Surface Sensor can be ordered as the sole surface sensing device or as an interchangeable device in addition to standard contact surface sensor. Non-contact laser surface sensor is used for optical determination of object distances without contact. Non-contact sensing bounces a laser beam off product surface to determine surface location. If product surface is rough or has a different surface color, laser data will vary. For applications with non-critical dispense height requirements, laser may be a fine choice. 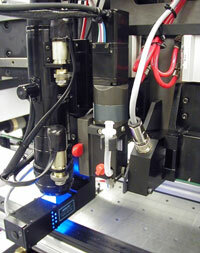 Laser sensing is not recommended for applications with dispense height requirements of less than 0.005".